In the 60's and 70's Columbia Bank produced a print series of JCM watercolors of regional scenes around Rochester, NY. Menihan painted an original watercolor for each branch location. The bank reproduced these local scenes and gave them away at their branch openings. Irondequoit, Bath, Painted Post, Canandaigua, Brockport, Honeoye Falls, etc. There are approximately 17 prints in the series. A technical note: The images were reproduced by four color process offset lithography. They are sensitive to direct sunlight; they may fade eventually. While the prints fully capture Menihan's painterly style and flair, these reproductions have relatively little financial value. John C. Menihan was perhaps best known for his limestone lithographs which are rare and valuable prints. Read more here. 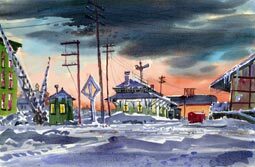 And of course, the subjects of these Columbia Bank prints, his watercolors are also sought by collectors.